Me.dium collects unanimous data from its over two million toolbar downloads and aggregates it as the real-time index for the social search product. Leveraging Yahoo! Search BOSS the site returns a blend of regular Yahoo and Me.dium social search results or straight Me.dium social search results for an "I feel social" search query. Giving Me.dium social search a try, I compared the social search results (above) to that of a regular Google search (below). 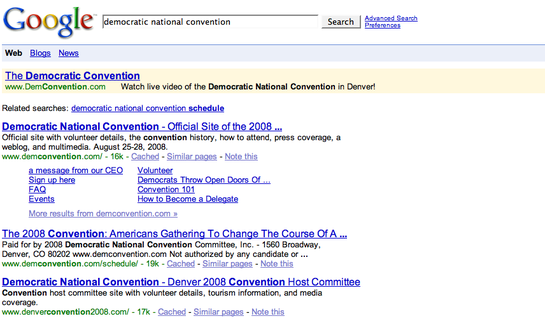 You can see the difference in relevancy for the two search results. The social search results are also timely and therefore will be different on the same search query at a different time. There have been a number of products that have embarked on creating a social search experience and I have come to find that they all seem to take a slightly different approach thus creating a field of relevant social search products. For example, Eurekster Swicki was one of the first I recall reviewing as they enabled users to create a customizable search experience but the experience reminded me of updating a wiki of search results. 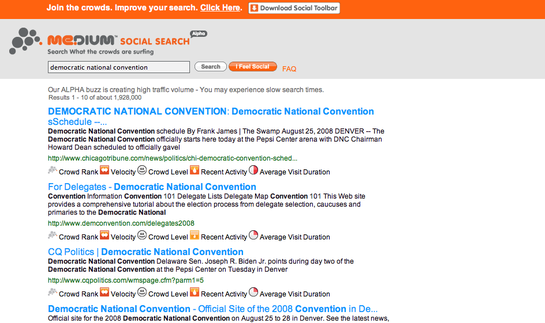 Delver more recently launched a social search based on your social graph data. Me.dium Social Search has created a real-time what's hot search engine based on what people are doing. With the release of the updated Microsoft Internet Explorer 8 beta 2 today, Me.dium Social Search has been incorporated along with EBay, Facebook, and Yahoo! as a search alternative which should give it some mainstream exposure. Overall, I am pretty impressive with the social search as it creates another place to find out just what is buzzing on the Web at any given time.